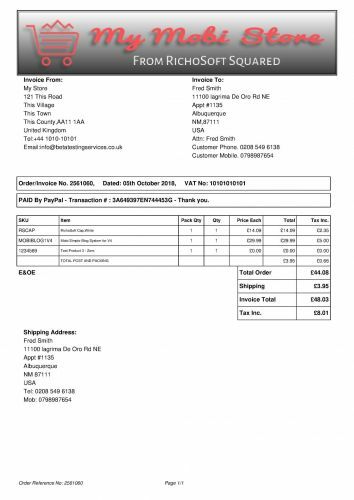 Invoice Plug-In for My Store System Site Template for V4 Mobirise* sites. Easily generate and download Invoices for any orders placed in your My Store. Shows each item, tax included postage and coupons. Shows Shop, Customer and Delivery addresses. Uses the same store header image as the email header. No set up apart from uploading a few files. All Required Support Files- Richosoft created code files and libraries. User Guide - In your pack you will also receive a comprehensive user guide to help you install and use your plug-in.